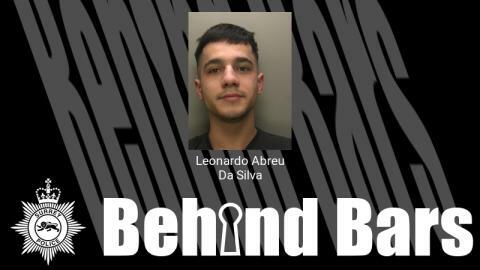 Leonardo Abreu Da Silva, 20, of Rookery Way, Lower Kingswood, was arrested on New Year’s Day on suspicion of being concerned in the supply of Class A drugs after being stopped in a car park in Redhill. Da silva was already on court bail for a number of other drug related offences and possession of weapons. After his arrest, Da Silva became obstructive, refused to sit in the police car and attempted to flee the scene. Following his arrival in custody, a sock containing six small bags of white powder was found in his underwear. He was also found with a significant quantity of cash and a mobile phone believed to be used in the sale of drugs. Tests confirmed that the white powder was cocaine, and Da Silva was charged with possession with intent to supply a Class A drug and concealing criminal property, and remanded in custody. Appearing at Guildford Crown Court last Wednesday (30 January), Da Silva was sentenced to 40 months in a young offender institution, issued with a £170 victim surcharge and ordered to pay £1500 towards the prosecution costs, satisfied by cash seized by Surrey Police. Reigate and Banstead Specialist Neighbourhood officer, PC Steve Ellis, said: “We will not tolerate drug supply or drug related crimes that impact on our communities. If you see signs of drug dealing, please contact us. Information received from the public adds to the bigger picture and builds our intelligence."